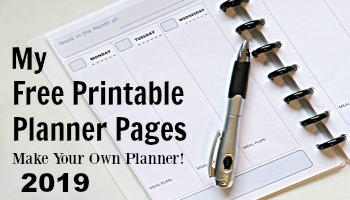 Stay up to date with all the brightest ideas for homemade living when you subscribe! Some people love those store bought air freshener sprays. I think they’re too strong and they make me want to cough. I’m just not a fan. Sorry. So what do I do if I want to add a welcoming scent to a room? 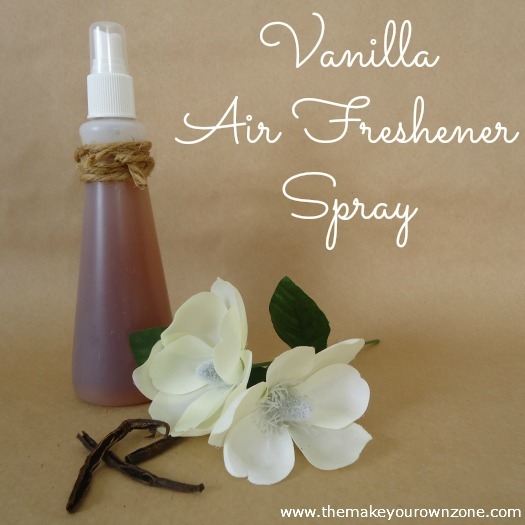 I make my own vanilla air freshener spray instead! This recipe came about quite by accident for me. I started out trying to make a spray with some essential oils but just wasn’t finding a combination that satisfied me. The more I thought about what scent I might enjoy, I realized, HEY, how about plain old vanilla? I like plain old vanilla. I like it a lot! I tinkered around (which thankfully is fun for me) and came up with this DIY vanilla air freshener spray. It’s sooo much nicer than the fake flowery smells of the store bought sprays. It’s super simple too! Just combine the cheap imitation vanilla extract with some water and you’re good! Be sure to use a Mist Bottle , not a spray bottle. A spray bottle shoots out too heavy of a stream and you’ll get things around the room wet. Spritzing some of this spray up into the air with a mist bottle works perfectly. Combine the water and the vanilla extract. Place in a mist bottle. To use, spritz some of the spray up into the air as needed to add the warm cozy smell of vanilla to the room. How about you? What’s your favorite scent to freshen a room? Can you put the liquid into a oil burner? I don’t think this mixture is concentrated enough (because it is just lightly scented water) to work in an oil burner. I am wondering if you could empty out one of those little plug in bottles and make a mix like this and fill the bottle and plug it back in to get the smell all of the time. I think this would probably work Cindy. I have seen people make DIY refills with essential oils and water so I think the vanilla extract and water might work too as a plugin refill. How long does the scent stay in the room before needing to spray more? Probably just a few minutes, but that’s what I like about it . . . I don’t like smells that linger around for too long so it works for me. Great idea! Thanks for sharing this post. I wanted to know: I’m really sensitive to anything imitation (eye issues), how much alcohol free vanilla extract would you use to water and do you think it will last as long? Well I usually tell people to start with less if you are experimenting because you can always add more, but you can’t take it back out once it’s in! So perhaps you could start with just 1 or 2 tablespoons to a cup of water, especially if the extract you are using is higher priced and you want to keep your spray economical. If that is not a strong enough scent for you keep adding a few more teaspoons at a time until you are happy with the scent. I think it would probably last just as long as the regular vanilla extract too. Are you allergic to alcohol? Because if you aren’t then alcohol wouldn’t be an issue. Alcohol free vanilla is made with glycerin. I have not had any problems with this spray attracting ants or other bugs. Using the mist bottle makes a really fine spray which helps. You might want to try something that contains a peppermint . Maybe a peppermint extract. I heard that the smell of peppermint isn’t liked by ants?? or mice?or roaches?? Anyways one of those critters don’t like the smell. This sounds fantastic! This may seem like a silly question but do you know if it attracts ants? Or stain carpets? Or does the water dilute it enough that this won’t happen? I have not had a problem with any staining or attracting of ants or anything. I use this spray primarily in my kitchen where there are mostly hard surfaces. I usually mist it up high in the air and let it filter down, and it’s a very fine mist that has not caused any unwanted side effects. We had run out of some vanilla air freshener. There was no brand name on the bottle, so I ‘googled’ vanilla air freshener and your site popped up. I immediately went to the kitchen and mixed up a batch and refilled the bottle!! Amazing!! So glad I found your site. Stories like yours make me smile. That’s why I love making our own stuff! I’m moving into my apartment soon and want a nice scent to spray in my room and bathroom! I love this!! Do you know how long the mixture lasts? Mine has been lasting for several months with no problems. If you make it with distilled water or filtered water, that helps it last longer too. Where do i buy the imitation vanilla? Does it actually says ‘imitation’ in the bottle? Imitation vanilla is what most people are buying when they buy vanilla at the grocery store and don’t even realize that in fact it does say “imitation” on the bottle. But you can also find smaller bottles that say “real” vanilla and those are quite a bit pricier. The flavor of the “real” vanilla is a little richer, but if you’re using it for an air freshener, the flavor doesn’t matter. you can use artificial food essence of vannila,in india they are sold in infinity. Can you use real vanilla instead of imitation? Lisa – you can certainly use real vanilla in this recipe, however the real vanilla is more expensive. If you use the imitation vanilla it keeps the cost of the recipe a little more budget friendly. My favorite scent, especially for kitchens and bathrooms, is lemon. Can you think of any reason you couldn’t substitute lemon juice? I think this is a great idea. I have some lung issues and strong, artificial scents bother me. I think lemon juice would work Barb. Good idea! Lemon juice may not be aromatic enough. Maybe try lemon essential oil. They have orange ,lemon and a few other extracts in the spice aisle of grocery stores. I refill a empty non-aerosol hairspray bottle for my mist bottle for my plants. You could paint or decorate that bottle and it is one more way to recycle. That’s a great idea! That reminds me that I’ve re-used the mist bottles from the body fragrance sprays too. They’re perfect for misting, but sometimes the fragrance smell lingers in them. To get rid of a lingering smell in a bottle I’ve filled them with water and a few teaspoons of baking soda and let them soak, with good results. where can I buy an empty mist bottle? this sounds great! Hi Loretta – Sometimes it can be a challenge to find mist bottles in the store. In the past I have been able to find them at a beauty supply store (Sally Beauty Supply), but lately they have been out of stock at my local store. They can also sometimes be found in the personal care area of larger stores where the travel size products are sold, but the down side of that is they are usually a small 2 oz size. You can buy them through Amazon too. (You can click on the link up above that says “mist bottle” to see an example). CVS , Walmart look in the travel bottle section. How To Dye Easter Eggs – With Kool Aid! Visit Bev Leestma | The MYO Zone's profile on Pinterest.